Human beings have migrated from their countries of birth, to other counties, since times immemorial. Displacement is at times forced, or as a by-product of colonisation, sometimes is it voluntary, driven by economic reasons. Yet the personal story of displacement remains relevant till today. In Implications (Mona Dash) the unnamed protagonist asks what it means for her to become more than what she was born with, and in doing so, explores intersectionality and living in a ‘pinpoint.’ The story is told through the eyes of a young Indian woman, who has moved to England after her marriage, but lives on the side-lines with a somewhat doubtful immigration status. Her eyes both adore and judge the lives of the people in the country she lives in. In Dash's story This can be mine, a sense of belonging is not absolute, and has different levels depending on the person and their location. Across countries and class, women often move to join partners for reasons of marriage or in pursuit of the man’s career. Their compliance is assumed and silence shrouds women’s experiences. In The Metallic Mini-skirt (Radhika Kapur) we dive into the protagonist, Divya’s, transition from Chandigarh to London. Her rose-tinted dreams of finding a freer, more liberal lifestyle in London are challenged by her mother-in-law. Importantly, her experiences refute stereotypes of the ‘West’ being liberal and the ‘East’ being conservative. In-between is a contemplative autobiographical piece, also from Kapur, it compares an ancient meditation technique of focusing on the space between breaths to the space between two selves. Overall, the anthology throughout foregrounds wistfulness, empathy and a desire for being complete in an incomplete world, whilst simultaneously celebrating this fractured world as a true reflection of the times, all of which is done with courage and enthusiasm. 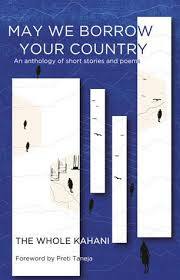 Details: May We Borrow Your Country is published in paperback and eBook, by Linen Press, priced in local currencies.